Over the past decade or so, the number of cameras at traffic signals has increased dramatically. During the same period, talk about red-light enforcement cameras has also increased and, in many jurisdictions, red-light cameras have indeed been installed..
As a result of the circumstances above, many people believe that all the new cameras they see at traffic signals are red-light cameras. However, this is not the case. Below are pictures of the various cameras you'll see at traffic signals and an explanation of their purpose. This is the most common camera type in use at intersections nowadays, and the one most people observe and mistake for a red-light camera. This camera is actually a video image vehicle detection system (VIVDS), also known by its trademark name "Autoscope". These cameras are used by the traffic signal controller computer to determine the presence of vehicles so that it can change the signals accordingly. This function used to be performed by inductive loop detectors in the pavement. However, the cost of the cameras is now low enough that they are more cost-efficient than loop detectors. Loop detectors are fairly expensive to install and reconfigure, have a somewhat high failure rate, and have limited capabilities compared to video recognition. The way these cameras work is fairly simple. The camera is mounted so that it has a wide view of the approach road that it will be monitoring. Once in place, an engineer at the system console draws "detection zones" within the view range of the camera of the areas that need to watched for traffic. The video computer then monitors the zones and when it detects a significant change in the image of that area (indicating the presence of a vehicle), it notifies the signal controller. The signal controller then uses that data to make the necessary decisions for changing the signals or timings. VIVDS cameras are also used to monitor traffic levels and perform traffic counts on freeways and on arterial roads. Although these cameras are not red-light cameras per se, VIVDS cameras are often used in red-light camera installations as the mechanism to detect when vehicles have entered the intersection. This is not even a camera, but rather an infrared receiver. These are part of a traffic signal preemption system, usually for emergency vehicles, but also sometimes for public transport vehicles. These systems allow an authorized vehicle to change the signal to green as it approaches the intersection. The vehicle has a forward-facing mobile infrared transmitter (MIRT). When activated, the transmitter constantly sends out a pulsed infrared signal. As it approaches within about 2,000 feet of a preemption equipped intersection, the device you see pictured above detects the infrared signal and notifies the signal controller. The controller then initiates a preemptive stop phase for all directions except the one from which the preemption vehicle is approaching. It then changes all signals (including left turn) to green for the approaching preemption vehicle to clear any traffic queues and give that vehicle full right-of-way. It holds the signals green until the vehicle clears the intersection, at which point the signal returns to normal operation. These are actual red-light enforcement cameras. The camera below is an older version; the one to the left is a newer type. 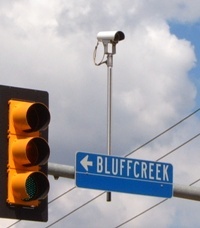 These cameras sit a short distance before the intersection on the approach road, facing toward the intersection. An inductive loop detector or a VIVDS camera monitors the area just beyond the stop line. When the signal turns red, the detector is activated. When it detects a vehicle passing the stop line, it signals the red-light camera, which then takes two or more pictures of the vehicle, usually with a telltale camera flash. The lens is focused on the violation area so that a clear view of the vehicle, its license plate, and the signal is visible. Additionally, the controller timestamps the image and records other pertinent details, such as location, direction of travel, and length of time the signal was red. These cameras may be either film or digital, and newer cameras often also collect a short amount of video in conjunction with the still frame photos to help validate violations. Periodically, the film or digital media is collected and the photos examined. In cases where the photos and/or video clearly show the vehicle running the red, a citation is sent to the registered owner of the vehicle. Photos of non-violations or of situations that are less definitive are discarded. In most jurisdictions, a sign similar to the one below is required to be placed at or on the approach to an intersection with red-light enforcement cameras.